Justin writes: I just finished reading your latest post about the money spent at a tailor. My brother and I were actually just talking about finding ourselves a tailor earlier today, and so I had a question for you. 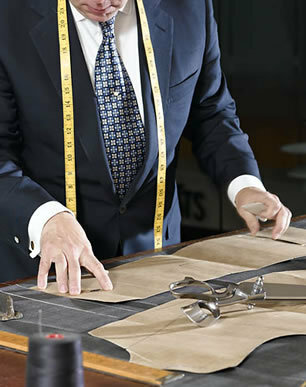 Is there anyway to tell a good tailor from a bad tailor before you spend the money? I had a pair of pants shortened at a tailoring franchise in my local mall and they didn’t turn out anything like I expected and I found another tailor but felt like they were maybe charging too much ($35 CDN for darting a shirt?) and so now we are looking at taking our clothes to one of two tailors and are not sure what exactly to look for. It can be tough to find a great tailor. I myself just went to the one closest to my house – it worked out well. Of course, the next time I tried that, a seamstress loused up the simple job of putting buttons on a coat. Luckily, I’d chosen a cheap and simple job for the first go-round, and the damage was inexpensive to fix. So, how do you find one? There are a few ways. The first thing I’d do is head over to StyleForum.net and AskAndyAboutClothes.com and try the search function. The denizens of both sites are knowledgeable and care about good tailoring, and if you’re lucky, someone has stopped in before, looking for a tailor in your town. Failing that, I’d call the men’s department of the best retail store in your region and ask who they use. If there’s a traditional men’s clothing store, like Cable Car Clothiers in San Francisco or Carrol & Co. in Los Angeles, all the better. Failing that, there’s always the combination of Yelp and small jobs. The first time you ask for something bigger, make sure it’s on something relatively expendable. The first major surgery my tailor did was on a coat I’d bought for $15 at the Goodwill. I figured it was worth the $40 to find out if he was any good. The answer was: he was pretty good. Good tailors are overwhelmingly men (there are good female tailors, but most women doing tailoring are really dressmakers or alterations who don’t turn down business from men), they tend to be older (since tailoring isn’t exactly a growth field), and they’re often immigrants. Sometimes they’re friendly, sometimes they’re not. Usually their workspaces are a crazy mess, or in a weird place. Start small, and work your way up. Hopefully you’ll find someone good.